Church Lane, Jevington, East Sussex BN26 5QE. Grid reference: 556100, 101600, View on: Google Maps, Open Street Map, Streetmap, National Library of Scotland Map or Oldmaps. 1783 - date - the OPC offers a look up service from a full transcription of the register. There are 6 burials in the OPC database. 1783 - 1971 - the OPC has transcribed the burials in full, including age and place of residence, and offers a look up service. The Registers of Banns (August 1754 - July 1820 and January 1903 - 7 November 2004) have been transcribed and a look up service offered. 1837 - 1945 - the OPC has transcribed the full information from the marriage register, including witnesses and full details of bride, groom and their fathers, a look up service is offered. 1755 - 1837 - the OPC has transcribed the full information from the marriage register, this register doesn't include the bride and groom's occupations or details about their fathers. There are 232 monumental inscriptions in the OPC database. The OPC has a complete transcript of all the MIs in both the church and church yard and offers a look up service. 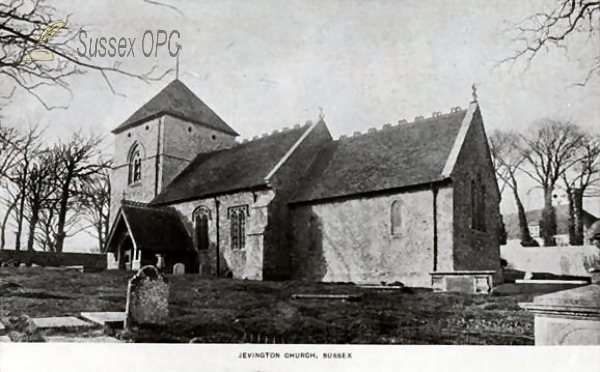 There are 17 images of this church in the OPC database. The (restored) Saxon tower is of two stages with herring-bone work and N.E. quoins long and short. The chancel, nave and N. aisle, with very small lancets, are E.E. The E. end window is formed of three long ogee trefoil-headed lancets under a broad low internal arch. The N. aisle is divided into two parts by a cross arch from central pier to N. wall. The nave has a fine waggon roof of king post and hammer beam alternately. Note: Dec. low-side window in S. wall of chancel; aumbry under lancet in N. wall; trefoil-headed piscina with shelf in S. wall; a round-headed squint on each side chancel arch; tablet to N. Coller, rector (169½). The curious bas-relief of our Lord (?) bruising the serpent's head, on S. wall above the porch, found in 18th c., is Saxon. Font, early Dec. of same local type as at Willingdon. The OPC has transcriptions of all the Bishop's Transcripts of baptisms, marriages and burials 1606 - 1670 as far as these survive. They are comprehensive 1606 - 1641, after that just the years 1664 and 1670.